The same flow has graced Luang Prabang’s streets for centuries. 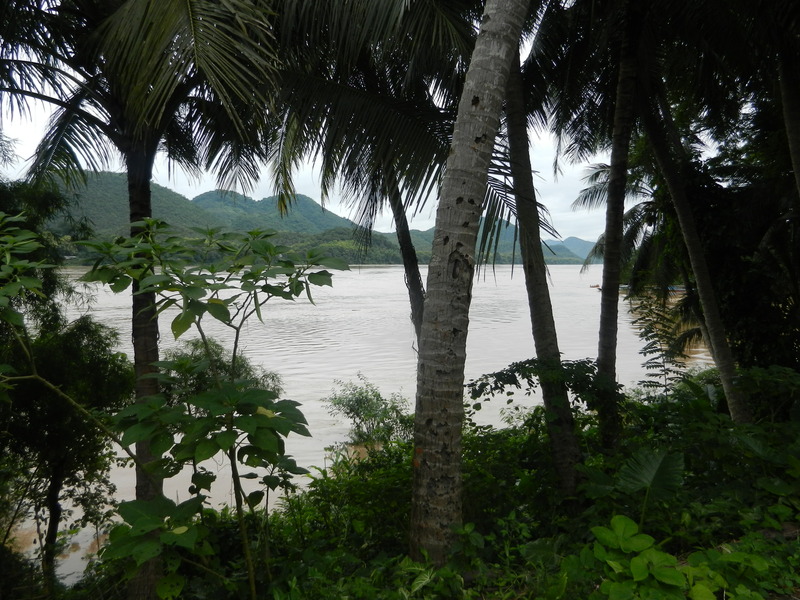 In the 14th century, King Fa Ngum founded the Lan Xang kingdom in Luang Prabang. In the 16th, King Photthisarat coordinated Buddhist rituals with the royal court and founded several monasteries. 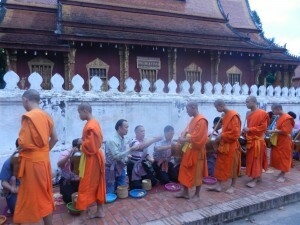 Since then, processions of monks and the stately royal palace have been associated. But deeper currents also enrich these processions. 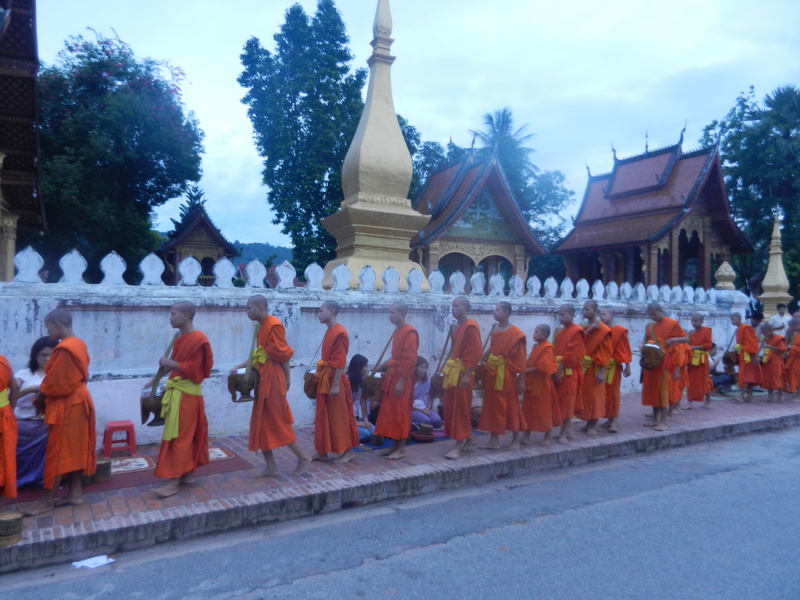 Every morning when I was in Luang Prabang, monks slowly walked out the gates of the many local temples and formed one long line that proceeded down the sidewalk. They carried begging bowls for their daily food. Lay people formed a row to place small packets of rice in their bowls. 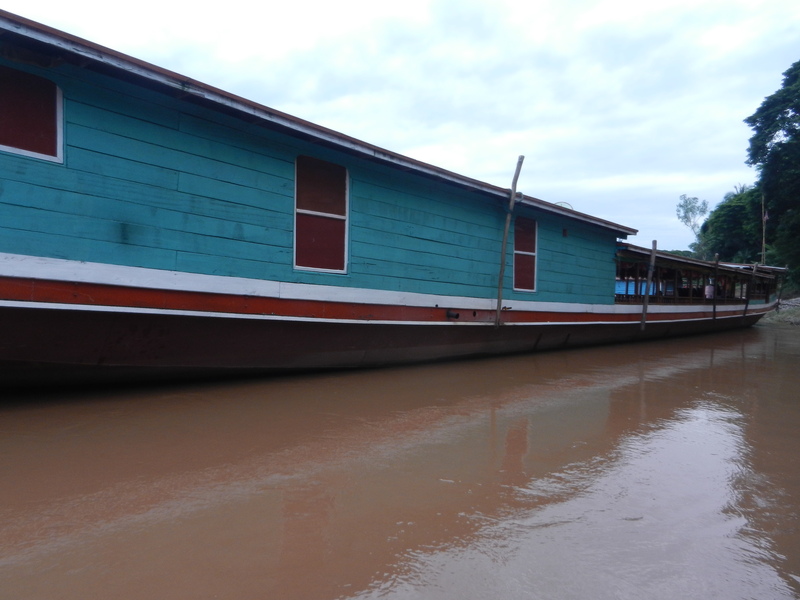 Two equally long rows met like boats on the Mekong River–it’s just 3 blocks away. The secular folks received merit for a better life and afterlife. The holy men got their daily food. Two equally long lines slowly pass each other, and their gentle meeting forms a field of merit. Society coheres within this field. 2. Boats and the rivers they flow on. 3. Art forms. The roof lines of the monastery assembly hall behind the lay people in the above photo gracefully curve from the apex to the outer edge. 4. The trees in the jungles around Luang Prabang. 5. Nagas (mythical serpents), which grace many art forms. An enormous number of experiences converge to make up each culture’s basic assumptions and models of reality. 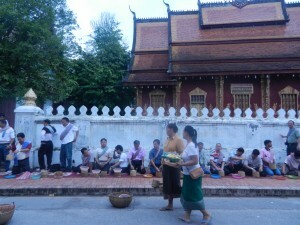 The old section of Luang Prabang gets a lot of tourists these days. A roughly equal number of Westerners and East Asians formed a third line next to the other 2 in order to photograph them. Yeah, I added to its mass, but I follow a strict “Don’t be a pain in anyone’s behind” policy. However, a few others stood right by the monks. But nobody seemed to mind. The holy people remained placid and never eyed the spectators. The local lay folks continued to talk to each other, smiling as though they didn’t have a care in the world. So all 3 groups of people meshed into the same type of tolerant flow that has integrated Southeast Asian cultures for many centuries. Even people who are a bit obnoxioius often blend into the land’s abundance of life forms.